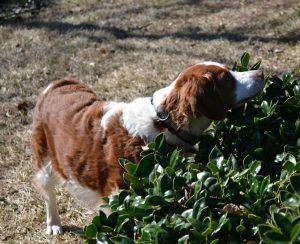 Nearly seven years ago, we adopted a sweet, shy Brittany named “Bailey.” BRIT told us that she was a great fit for our family but would probably have to be the only dog. We were okay with that because Bailey provides us with an abundance of love, fun, and excitement. Bailey is best known for keeping our “critter” population to a minimum, spending more time in the pool than we do, and loving long walks (only to come home and run out in the back to jump in the pool). She is also great at telling time and letting us know if we are late in serving her meals. As we socialized Bailey throughout the years, it became evident that she could get along with other dogs. So, with the help of BRIT, we added two more Brittanys to our pack. Our sweet, shy girl could share her people and love with her Brittany brothers (Deano & Jack). Bailey quickly let the boys know who got the pick of beds, toys, treats and food. There was so much Brittany bonding happening in our house! In June of 2016, we noticed when treats were being tossed in the usual manner, Bailey sat and waited for hers as they bounced off her nose. We dismissed the idea that anything was wrong and gave her treats anyway. By late July, when we returned from a family vacation, we noticed Bailey was still not able to catch treats and spent more time sleeping during our family playtime. She seemed disoriented and unhappy. 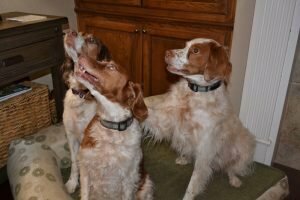 When the pack was headed outdoors in the usual way one morning, we noticed that Bailey went to the wrong side of the door. By this time, we were keeping a close eye on her and experiencing some denial that something might be seriously wrong with our girl. We took Bailey to a veterinary Ophthalmologist and, during that first visit, were told she had minimal sight left in both eyes. She had signs of retinal degeneration and severely decreased vision. This is likely due to a disease called progressive retinal atrophy (PRA). Other causes of blindness could not be ruled out, including SARDS, and long term treatments were discussed. The vet encouraged us to seek out resources that showed Bailey could and would be able to resume a normal, happy and healthy life. Once we decided to leave the (our) initial denial and sadness behind, our lives returned to normal, but differently. The first place we turned for support was our very own BRIT rescue. We were quickly given resources of friends within the group who reached out to provide books, websites, a cool bandana that says, “I am Blind” for walks and more! As the photos show, Bailey still chases “critters,” eats with the pack, goes on long walks, and gets her snack bone first! 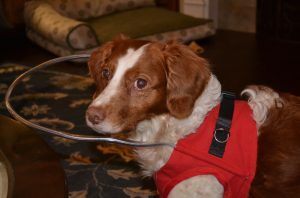 Bailey now uses a HALO VEST around the house until we figure out navigation. http://www.halosforpaws.com We make sure furniture is not moved and tidy up more around the house (not a bad thing). The most endearing transformation is watching the unspoken (amazing) love and compassion of Bailey and her Brittany brothers. They still let her lead the way, but are now her eyes and comfort each day (Jack licks Bailey’s eyes each morning and evening). 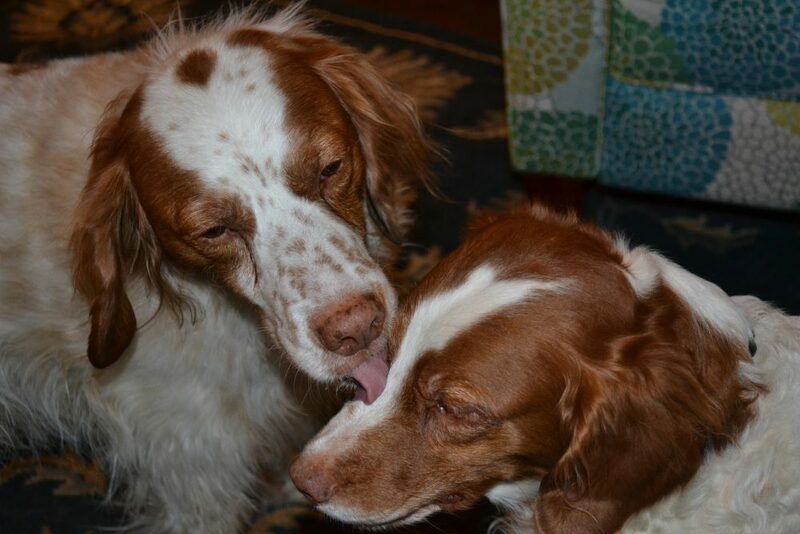 Bailey and the boys have learned how to share and their love has come full circle!